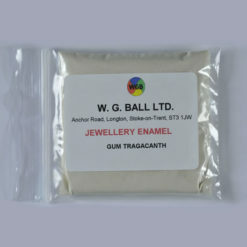 Gum tragacanth is the traditional gum for dissolving in water to make a solution to hold dusted enamel in place on curved surfaces prior to firing. Mix 5ml. 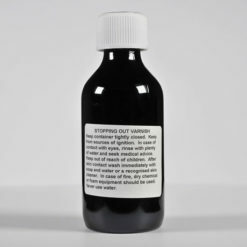 (small teaspoon) in 600ccs of water. 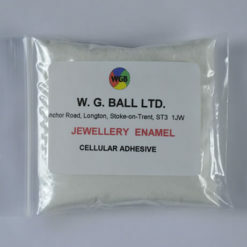 Cellular adhesive is a modern equivalent to gum tragacanth. Mix at same ratio as gum tragacanth – it is much easier to dissolve than gum tragacanth. 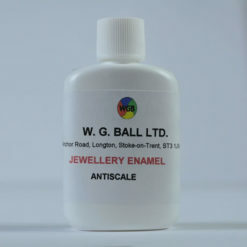 Antiscale is used to reduce the amount of scale on uncovered copper during enamel firing. Paint it on to copper and allow it to dry. Stopping Out Varnish is used to protect areas of copper not to be etched when copper etching.